Posted on Twitter by Kyle Lacey, quote by Mario Andretti. Are you a control freak? Do you have to know how things will be going at all times?? 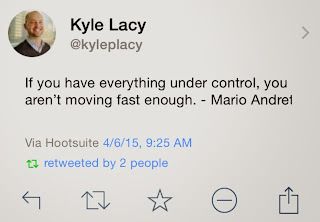 This quote suggests that if you have everything under control that you aren't going fast enough. What an interesting thought? What are some pros and cons to this train of thought? Feel free to follow @kylelacey on Twitter. I do and I throughly enjoy it! !